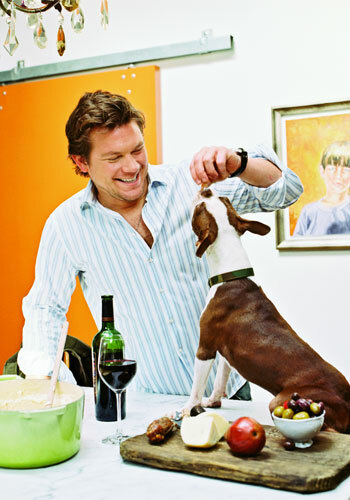 You’re watching Food 911, Tyler Florence’s no-nonsense, to-the-rescue Food Network series. The segment is on Soul Food. The woman, who’s learning to cook it, is black. 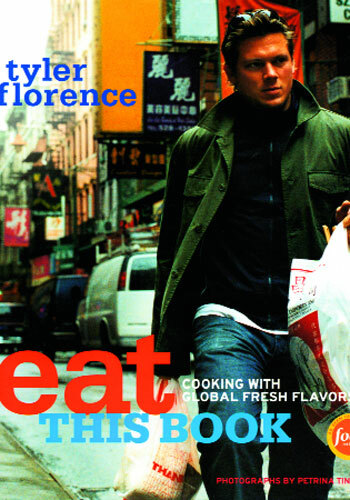 If the construct seems skewed, no one seems to care—certainly not Tyler Florence. 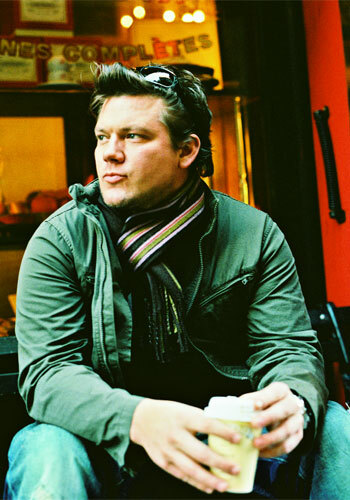 A South Carolina native and rising media star, Tyler Florence (the subtly insistent double trochée in his name, TY-ler FLOR-ence, suggests the Southern patrician), has plenty of cause for confidence. 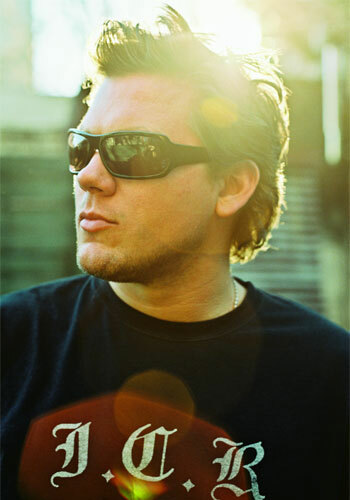 Employed by the Food Network full-time since 1999, Florence has, to his credit, 300 episodes of Food 911; 36 episodes of a globetrotting series called Tyler’s Ultimate; and four seasons hosting the show How to Boil Water. His next Food Network series (details on ice pending a formal launch) is in pre-production. He has written two cookbooks, Tyler Florence’s Real Kitchen and Eat This Book, and is poised to close a deal on a restaurant in lower Manhattan. He is 34 years old. 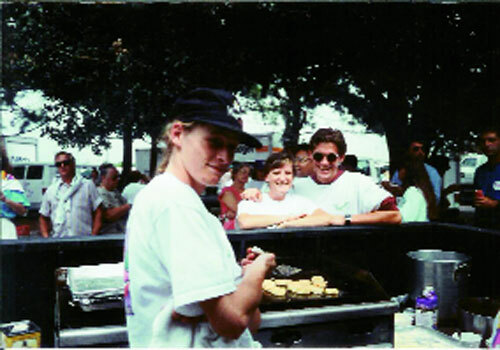 It was after culinary school that he first experienced Southern regional cuisine in concept and execution, doing a year of kitchen time each under Donald Barickman at Magnolias and Louis Osteen, then of Louis’ Charleston Grill—two chefs with two very different takes on the same foodways. Florence describes Osteen as a classicist who looked to the past for sources of inspiration and gripped tradition hard. A fried green tomato would be served with a spray of sea salt—nothing more. Barickman, on the other hand, was inclined to throw Southern ingredients in a jar, shake them, and see what came out. Both chefs, Florence contends, influenced the way he cooks today. Florence sprinted through a handful of notable Manhattan kitchens in the early ’90s—including Aureole on the Upper East Side and the River Café in Brooklyn—before securing, at 25, a job as executive chef at a midtown restaurant called Cibo. He recalls his early years in New York as a period of difficult adjustment—it’s an impression his resumé does not reflect. While at Cibo, Florence scored television appearances for the fledgling Food Network—the PR company hired by the restaurant also represented the media people. He describes his initial on-camera experience as “four and a half minutes of stutter and sweat.” At the end of the day, however, all he wanted was more. By 1999, four and a half minutes had expanded into 18 (plus four commercial breaks), and Florence was doing 30-minute Food 911 shows—full time. In his books and on television, Florence strives to bring forward the notion that “brilliant, simple cooking” is not insurmountably difficult. Fledgling home cooks, he believes, must commit to buying a decent set of pots and pans and a decent set of knives (three will do) as well as to practice cooking a couple of nights a week, when there’s no pressure. Don’t venture into uncharted recipes for a dinner party or begin with recipes that run on for days, he says. What does Florence bring to the camera? His fan sites are legion. Katie Couric has called him the “sexiest man to ever pick up a chef’s knife.” On Food 911, women guests barely get beyond the state of mute rapture and dropped jaws. (It could, of course, be the food—when Florence feeds women guests from a spoon, their eyes roll heavenwards.) And it doesn’t hurt that he is boyishly good-looking, generally flexing a fair amount of forearm, and custom-fitted for the Food Network demographic: female, 25 to 38 years old, two kids, remodeled kitchen. Ask Florence to account for the stunning velocity with which he stacked up four television series with Food Network (Nielson number one rated for host recognition), wrote a couple of cookbooks, closed a restaurant deal, and launched a new Braun immersion blender, and he’ll tell you it’s by “being himself” every day. It sounds like a non-answer—practiced and reductive. 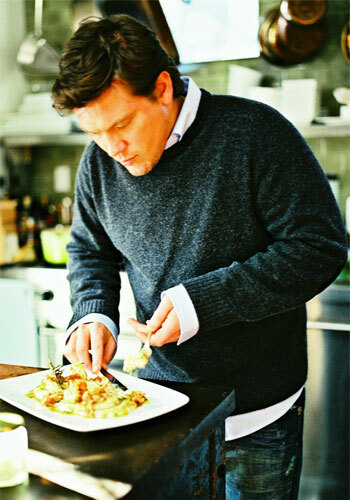 Yet knocking around his Lower East Side loft in Manhattan or pacing through Chinatown or Little Italy after ingredients, the real-life Tyler Florence (who admits time management is his biggest challenge) does not seem terribly different in person from the Tyler Florence on TV. He moves and speaks like a New Yorker—focused, driven, and perpetually late for a meeting. The confidence we experience on television is clearly an extension of who he is as a man. At home, cooking shrimp and polenta with pancetta and herbs (a dish he calls Grits and the City) for lunch, Florence moves easily through prep, assembly, and execution, maintaining the easy banter he does on TV. He’s wearing G-Star Raw jeans and a pair of old-school Adidas. He’s got thin-sliced pancetta sizzling in a skillet with wreaths of herbs and crushed garlic. 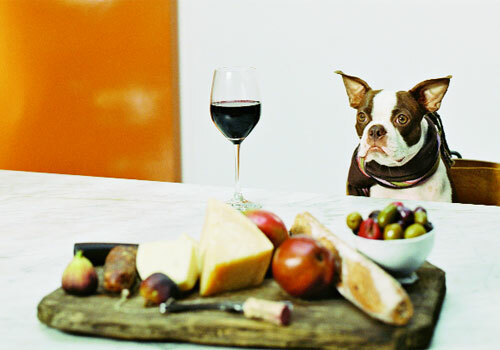 Florence’s Boston terrier, Jake (middle name Bacon)—who keeps vigil for scraps but moves nimbly out of Florence’s footpath like any good chef dog—scores a curl of crisp pancetta. Tyler Florence’s next big move, what he calls “an anchor on the definition of what I am as a chef,” will be his new restaurant. Occupying nearly a full corner block on Kenmare Street in lower Manhattan on the fringe of Little Italy, the restaurant will be appointed in the style of an contemporary farmhouse and serve rustic Italian food. Its name: Bar Florence. Authentic cooking styles the world over, Florence notes, share similar sensibilities. “The cooking of Tuscany,” he says, “is very similar to cooking in the South—simple ingredients, braised for a long time, soft and mushy and rich.” Just as the simple, elevated dish he’s prepared for lunch shares sensibilities with the Lowcountry classic, shrimp and grits. The characters’ names, of course, have been changed—bacon to pancetta, cheddar to parmesan, butter to olive oil, grits to polenta—but they’re basically brothers. And satisfying on the same primordial level. So what, after all these years, is Florence’s favorite Southern dish, the dish he craves and makes at home more than anything else? Fried chicken, he says, without hesitation. That’s Gucci fried chicken to you.